Perfect for Smoking, Grilling and Barbecuing. This traditional Large rounded shape Kamado style cooker will give you years of enjoyment and satisfaction for all your favorite recipes. The Primo Kamado has everything to satisfy the purist and anyone how enjoys the flavor of food cooked over a charcoal fire. 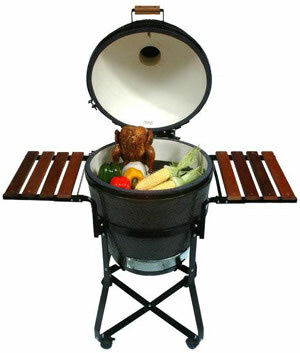 The Primo Kamado is your path to enjoying the finest in outdoor cooking. Unlike other charcoal grills, your Primo Kamado can be up and cooking within minutes, without the hassles of using nasty lighter fluids.With natural lump charcoal, and one of many simple non-toxic methods of lighting, you can be ready to cook in as little as 10 minutes. Add your favorite wood chips or chunks for a genuine wood smoke flavor. Set your vents to maintain your desired temperature. . . from low/slow to red-hot for searing. . . from roasting to baking...and relax while you get ready for the best eating yet. Use the Primo Grill Lifter to safely and easily lift hot cooking grids to and from the grill. Try your hand at crispy pizzas, chewy cookies, fresh bread, and more with a Primo Pizza/Baking Stone. With this porcelain-glazed, ceramic stone, you can prepare professional-quality baked food in the comfort of your own backyard. The Oval Junior uses a 13" Diameter Stone.